Photos by Jessie Bell (left) and Jenn Burt (right). This sponge takes the form of a thick yellow green crust that is peppered with little “volcanoes” which are really the sponge's excreting pores. It has a very diverse morphology and can colonize algae or form huge colonies on rocks up to 20 cm thick and several meters long. When broken this sponge emits a strange smell, similar to gunpowder. This species is found to depths of 100 m. It tolerates drying out better than other sponges and so can be seen in the intertidal zone. It is most commonly found on rocks on the outer coast, and is also found colonizing kelp stipes and other algae. 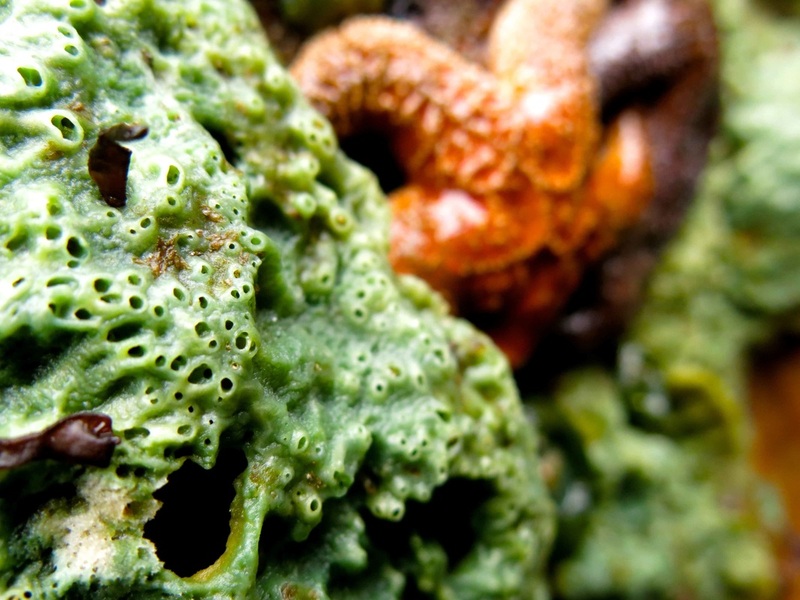 Yellow-green encrusting sponge inhabits coastal habitats in nearly all the world’s oceans. Other encrusting sponges can look similar, but Halichondria panacea has a very distinctive smell. 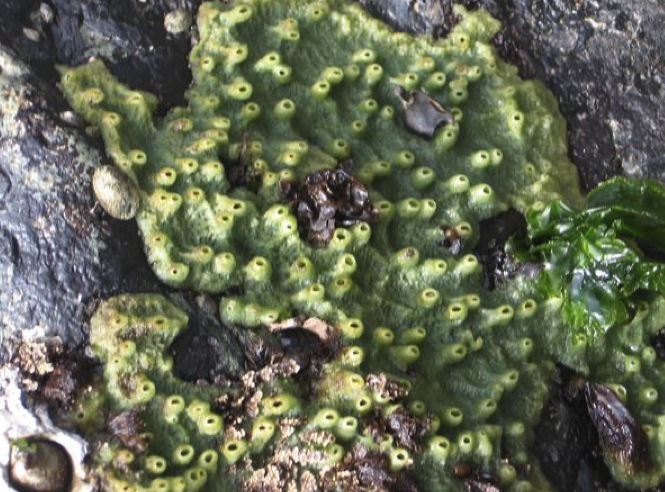 Its ability to withstand drying makes it one of the few sponges that is commonly found by beachcombers, so is a likely candidate when a sponge of this description is found in the intertidal. The gunpowder smell of the yellow-green encrusting sponge is actually a deterrent to would-be grazers. The sponge reproduces sexually, but can also reproduce asexually by pinching off a section of itself and setting it adrift to colonize a new location. Halichondria panacea. Encyclopedia of Life. Accessed 26/06/2014. Harbo, R. M. (1999). Whelks to whales: Coastal marine life of the Pacific Northwest. Madeira Park, BC: Harbour Publishing. P. 24. Fin Smith, Kelly Fretwell, and Brian Starzomski (2014).